Stockholm, Norwegian Fjords, Alesund, and more! 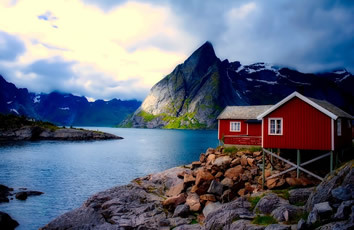 Norway is actually more stunningly beautiful and majestic than you ever could have imagined. 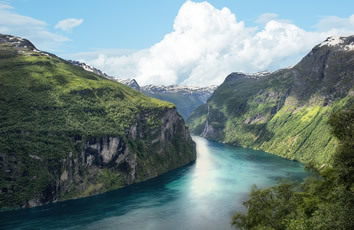 Norway is so pristine that you likely will not see one piece of litter your entire time there. 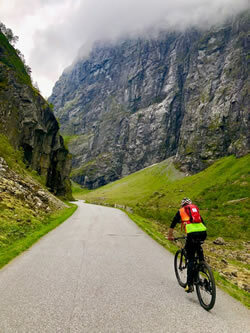 It is not just natural beauty and soft adventure that will get you excited about Norway. There is even incredible fashion. 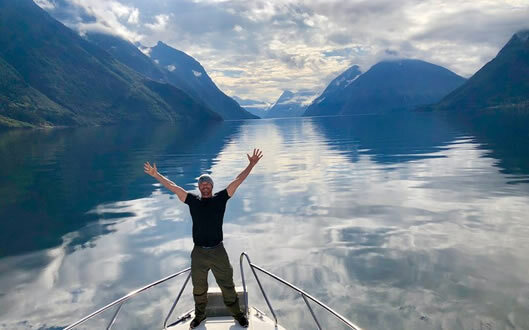 In fact, one of your favorite days on the tour will be our helicopter ride through the fjords to an incredible shopping area full of outlets of Norway's best fashion, made with quality materials. • Visit the remarkably intact 17th century warship, the Vasa, salvaged from the bottom of the ocean. • An experiential canoe trip, giving you an up-close, zen-like experience most do not get to have in Norway. • “Until Next Time” dinner and cocktails in Norway. • Like all Zoom Vacations tours, this trip is peppered with special over-the-top Zoom Vacations signature events! • Arrive in Stockholm, Sweden. Nobis Hotel: Outstanding personal service and unique experiences in gastronomy, accommodation and atmosphere are the key characteristics of our hotel. The interiors, designed by celebrated Swedish design trio Claesson Koivisto Rune, contrast with the buildings’ original late 19th century architecture. 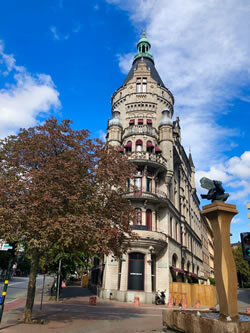 Here at Nobis Hotel both international business travelers and gourmet seekers check in to enjoy our time’s luxury – a relaxed, simple and elegant experience in the heart of Stockholm. • This evening, we depart our hotel for a special surprise welcome dinner event, in the heart of the city. • Breakfast, included in your stay. • We begin our day with a fun, zany tour of the ABBA museum. Visit to POP House Hotel including ABBA the museum At ABBA The Museum you can be a part of the success story. 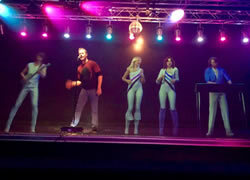 You will also find ABBA’s spectacular costumes, gold records and original items and much more. Plus earlier this year, the museum opened a brand new wing to document ABBA’s journey after the band stopped performing together. In the same building you’ll find POP HOUSE Hotel with 49 stylishly decorated hotel rooms. Plus you’ll never know who you might see there, perhaps you might even get a sneak preview of their new releases at the end of the year. Here’s a tip. If the red telephone rings, make sure you’re the first to pick it up! 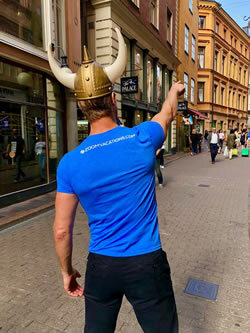 • Next we do like the locals break for a casual lunch in Stockholm. • Late afternoon, we visit one of the most extraordinary museums in Europe, the Vasa Museum, home to the royal flag ship Vasa. Built to fight the kingdom of Poland in the early 1600s, it sank on her maiden voyage, in the Stockholm harbor. More than 300 years later it was successfully raised, preserved and restored by Swedish divers and scientists. 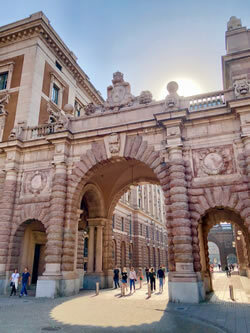 • This morning, we tour Stockholm with the best guide in the city. 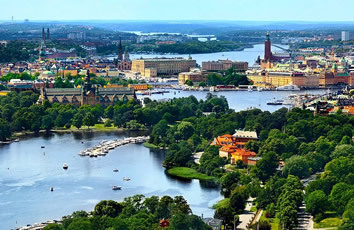 • Late afternoon, we venture 20 minutes outside of the city to Zoom Vacations’ owner, Bryan Herb’s favorite place in Stockholm, the Millesgården. There we will enjoy lunch followed by immersing ourselves in the magical wonderland. of Carl Milles. 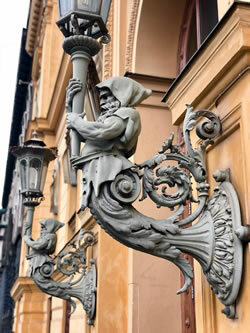 The artist's home was built in 1908 by the sculptor Carl Milles and his wife the artist Olga Milles. 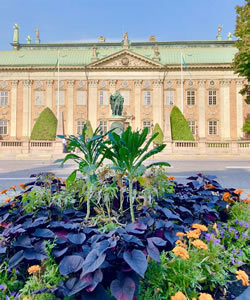 Millesgården is today a museum with the artist's home, antique collection, a vast sculpture park, an art gallery with a museum shop and a restaurant. • This evening we toasty a frosty goodbye to Stockholm at the very special Ice Bar, Stockholm! 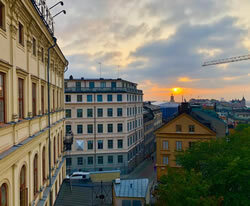 • This morning, we head to the airport and depart Stockholm for the Norwegian fjords. • Arrival at Ålesund Vigra Airport. Meet and greet with a private car from airport to Storfjord Hotel. Storfjord Hotel: Storfjord Hotel is a secluded luxury boutique hotel situated in Glomset, on a hillside overlooking the Storfjord and the Sunnmøre Alps. 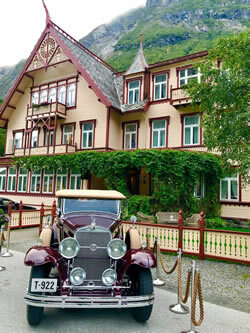 Ever since we opened in 2006, Storfjord Hotel has been ranked as one of Norway's best overnight stays and is the only hotel in Norway which is member of the Small luxury hotel of the World. Behind the handcrafted log walls awaits an experience you won't find anywhere else. Hautua summit is the highest point between Glomset, Sorte og Valle at 354 metres above sea level. 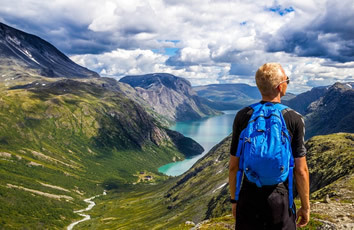 The path starts at Storfjord Hotel and rewards hikers with great views all the way to the top. The trip takes approximately 2 hours and is about 2.2 km long. Start by walking the charming forest road and then follow the marked path all the way to the top. 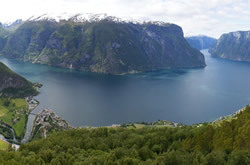 Take time to enjoy the spectacular views of fjords and mountains before you head back to the hotel. The path may be a bit moist so we recommend bringing warm hiking shoes to keep you from getting wet. The hotel will provide a map and packed lunch to bring along for your hike. After a lovely breakfast, it’s time to visit the locals. We will take you to the most charming couple, Inger Anne and Bjørn will greet you at their special place and have some wonderful time exploring Norwegian traditions. Learn about Norwegian food culture and traditions at one of the nearby farm at Glomset. The local, gorgeous couple will share their knowledge and tell you about how the food culture affected their lives on the farm. You will be invited into the old farm house where you will have the opportunity to taste the local produce harvested in the immediate area and Storfjord. After a lovely breakfast and check out, it’s time to go on a private fjord cruise to Hotel Union Øye. 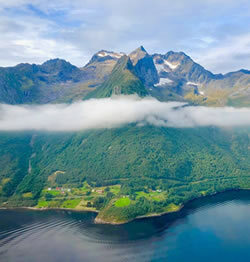 Sheer mountainsides rise from the deep fjord – this is the heartland of the Sunnmøre Alps. Ever since the 1850s, emperors, adventurous and mountaineers have sought out the sights along its shores. • The dramatic combination of towering mountains, tranquil fjords and charming villages make this an unforgettable excursion. Worth nothing, the enchanting Hotel Union Øye is situated at the head of the Norangsfjord. 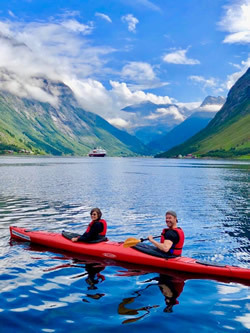 • The boat will stop at Urke, where you kayak guide will take you kayaking for 1,5 hours till you meet the end of Hjørundfjord and where the majestic Hotel Union Øye appears. • After check in and lunch, your guide will meet you by the front desk and take you on a bike tour through the amazing Norangsvalley. Arrive to Lyngstøylvatnet where you will have a stop over a bonfire. • Dinner and overnight at Hotel Union Øye. Hotel Union Øye: In the village of Øye by the Norangsfjord you will find one of the most distinct hotels in all of Europe. It has been a place where visitors come to savor the good life and the tranquility in magnificent surroundings since 1891. It has been a favorite venue of royalties, writers and lovers for generations. The 27 rooms, all of which are individually furnished with carefully selected antiques, are named after notables who have stayed here: Kaiser Wilhelm, King Oscar, Queen Maud and Princess Victoria; the authors Karen Blixen, Knut Hamsun and Sir Arthur Conan Doyle; the composer Edvard Grieg, playwright Henrik Ibsen and the explorer Roald Amundsen, to mention but a few. A stay at Hotel Union Øye is like being transported back in time. 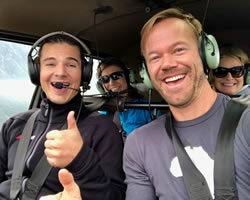 • Check you from Hotel Union Øye and the helicopter awaits for you to take you to Devold Outlet factory. • Devoldfabrikken is a unique cultural and shopping destination. In its historical industrial buildings you will find attractive designer outlets and local boutiques, cosy eateries and creative artists. Visit the smith’s workshop, experience a working artist’s studio and step into the heat in the glass blower studio. At the wood artist, you can buy beautiful handmade designer pieces, visit the Nordic region’s largest model railway and get to know the history of the Devold Museum. After some serious shopping it’s time for privately wild life sea safari for 2 hours adventurous rib trip in the ocean. Let the adrenalin flow freely on an exciting safari on the open sea on an open, high speed RIB. 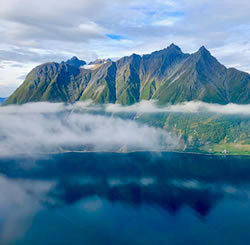 See Ålesund from the sea; visit the sea colonies and experience puffins and sea eagles on the island of Runde. We will tell you some interesting stories about the area and guide you through a fantastic mountain, coastal and Sunnmøre outdoor experience. 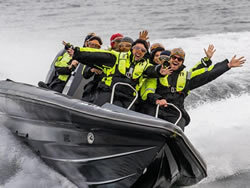 We adapt our RIB trips to suit your wishes and promise you’ll have a fun and fast paced adventure out on the open sea. Enjoy a lovely fish and seafood restaurant, placed on a tiny little island. For centuries Skotholmen has been a herring processing site. Its main business was the salting of herring. As recently as the 1950s Skotholmen was a bustling little place with a herring processing site including a filleting and freezing plant. The passion for local produce is reflected in the menu at the restaurant. Based on the catch of the day, the kitchen will present creative servings in an informal atmosphere with spectacular views towards the open sea. 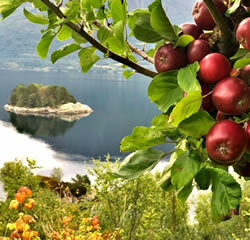 • After lunch, go back to Ålesund directly to the pier of Hotel Brosundet for check in. Hotel Brosundet: Hotel Brosundet is a family owned, designer boutique hotel in the small town of Ålesund. With its direct access to the sea and a private pier the adventure begins at the doorstep. We believe in creating experiences satisfying all senses - paying attention to what is seen, heard, smelled, tasted and felt. From the delicate interior design, stunning artwork, and antique beams to fresh local seafood. All this and the company of locals who have Hotel Brosundet as one of their favorite spots in town. Apotekergata 5, which today houses Restaurant MAKI and Hotel Brosundet,was originally a warehouse where the fishermen’s catch of the day was processed. We are proud of our heritage and today you can enjoy the catch of the day in our seafood restaurant. As in earlier times, we have the same focus on quality produce. 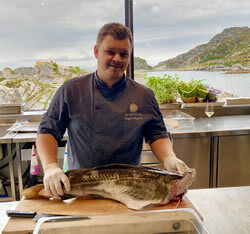 Our menus are based on the catch of the day from Sunnmøre, and the kitchen is working within the different seasons. 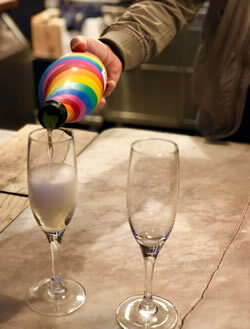 Our recommendation is to let the kitchen be creatively free and serve you one of our tasting menus: STOR FANGST 5-courses and LITEN FANGST 4-courses. 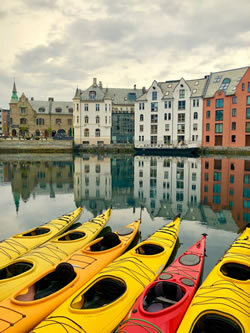 Enjoy sightseeing by foot in Alesund. Ålesund lies magnificently over several islands, where the fjords and the Sunnmøre Alps meet the sea. Ålesund has a long and interesting history. After the devastating town fire in 1904 the town was rebuilt in the unique Art Nouveau style that now characterizes the architecture of the town centre. The Art Nouveau Center has both fixed and temporary exhibitions spread over three floors, in addition to the genuine Art Nouveau interior of the actual building. 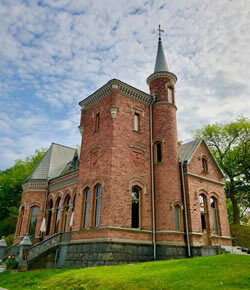 The Art Nouveau Centre is situated in Apotekergården, which is one of eleven listed Art Nouveau buildings in Ålesund. Another listed building in Ålesund is Hotel Brosundet. We strongly recommend a visit to The Art Nouveau Centre’s time machine, which takes you back to the town fire of 1904. The centre also has its own cafe and shop which sells local art and local food produce. From the city park in Ålesund, you can easy walk the 418 stairs to Aksla Mountain with a great view over Ålesund and the islands which surround the art nouveau city. The walk will take 10-20 minutes and have nice view points up the renovated stairs (or by car). • This afternoon, transfer for departure flights home. 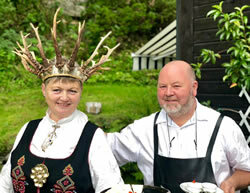 Hotel Brosundet is a family owned, designer boutique hotel in the small town of Ålesund. With its direct access to the sea and a private pier the adventure begins at the doorstep. We believe in creating experiences satisfying all senses - paying attention to what is seen, heard, smelled, tasted and felt. From the delicate interior design, stunning artwork, and antique beams to fresh local seafood. All this and the company of locals who have Hotel Brosundet as one of their favorite spots in town. Their passion is to preserve the buildings as they originally were: warehouses significant to the fishery based in Ålesund. As soon as you enter the hotel you will find inspirational design combined with an authentic story to tell. The outer walls of the hotel extend directly to the waters of Brosundet, Ålesund’s true town center. mA short 5-minute walk from the hotel you will find the charming Molja Lighthouse, which is room 47 at Hotel Brosundet. Located in town at the end of a jetty this is a spectacular overnight stay with views towards the Atlantic Ocean. International and domestic airfare not included. Web Page © Happy Travel, Ltd. Logos and Images © Zoom Vacations, Atlantis Events Inc., etc.